Simisola Bolatito Ogunleye who is known as Simi is to star in Mokalik by Kunle Afolayan. It is a bit surprising as the X3M Music star is taking a shot at acting. She would be acting with popular actors like Femi Adebayo, Faithia Williams, Ayo Adesanya, Lateef Oladimeji among others. It is Official: Simi @symplysimi is featuring in “Mokalik” a Kunle Afolayan film. ‘Jamb Questiom’ crooner, Simisola Ogunleye, aka Simi, has accepted a role in Kunle Afolayan’s coming film, ‘Mokalik’ (Mechanic). The agreement was formalised on Sunday, at the filmmaker’s office, in Lagos. 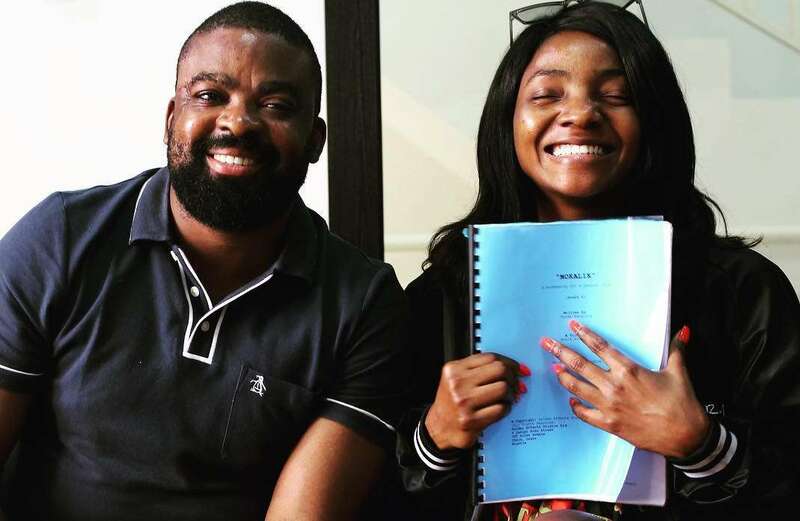 Beaming with smiles, it is obvious that the sonorous singer, who returned with a ‘Yes’ to Afolayan’s Golden Effects’ office after a week of studying the script, cannot wait to make her debut on the big screen. Taking to Instagram minutes later, she shared a voiceless video of herself seated beside Afolayan and flaunting the movie script, with the caption: “@kunleafo and a girl with a script she likes very much.” ‘Mokalik’ (Mechanic) follows the career of an 11-year-old boy, Jaiye, from the middle-class suburbs who spends the day as a lowly apprentice at a mechanic workshop in order to view life from the other side of the tracks. Afolayan says ‘Mokalik’ is a slight departure from the flicks he had shot in the past, adding that there will be two versions of the film; one for the Nigerian market – the other for the international market. Screen-played by Tunde Babalola, inspiration for the story, according to the filmmaker came during his constant visit to the mechanic workshop where he refurbished his much publicised Vintage car (Thunderbird Ford 1965) recently, while the film title, a Yoruba corrupt pronunciation of mechanic is from a scene in one of his late father (Ade Love)’s classic, ‘Taxi Driver’. “Visiting the mechanic workshop after about 15 years opened my eyes to a lot of things that I believe the world should know about our local auto car repairs industry,” he said. Simi will be playing Simi; daughter of a Buka (cafeteria)owner whose character holds a significant part in the movie plot.